GCA Altium has advised BPE and the managing shareholders of BE-terna Group, one of the leading full-service IT solutions providers in German-speaking Europe, on the sale to Deutsche Private Equity (DPE). BE-terna is the go-to-partner for mid-sized companies in German-speaking Europe offering solutions across the entire enterprise suite, including Enterprise Resource Planning, Business Intelligence, Customer Relationship Management and Human Resource Management solutions. The company is one of the largest Microsoft Dynamics 365 partners in German-speaking Europe and positioned at the forefront of cloud transformation. BE-terna has grown steadily since its foundation in 2005, generating revenues of almost EUR 70m and employing around 500 people at 12 locations in Germany, Austria and Switzerland. Supported by DPE, BE-terna plans to continue its strong organic growth in its core segments, further grow its service portfolio while, in the medium term, expanding through strategic acquisitions. BE-terna's CEO Christian Kranebitter commented: "In a technologically rapidly changing and consolidating market, we see ourselves as a leading provider of technology solutions that are deeply rooted in the respective business processes and require interdisciplinary approaches. In order to be able to map the spectrum of possible solutions and latest technologies and create real value-add for our customers, we want to continue our growth path. 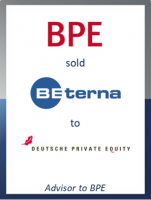 With DPE, the BE-terna Group has now gained an investor and partner who will actively support the company’s expansion with its expertise. In addition to DPE’s experience in supporting the growth of medium-sized companies, we were convinced by DPE’s entrepreneurial spirit and value orientation." Sascha Pfeiffer, Managing Director at GCA Altium, added: "It was a pleasure to assist BPE and the management team of BE-terna in recent years in executing their dynamic consolidation strategy. During this time BE-terna has successfully grown into one of the largest MS Dynamics partners in German-speaking Europe. We are convinced that DPE will be the right partner for BE-terna in continuing this path in the future."